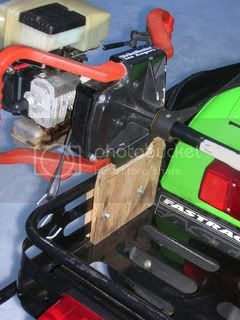 Auger mount for snowmobiles - - - 7 messages. Showing 1 through 7. I've seen them,but forget where.I think Sand Burr knows as it was his business for awhile. We dont sell them anymore but shouldnt be hard to fabricate yourself now that you have the idea. 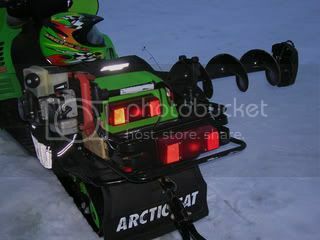 Most of guy's I know with Snowmobile Auger Racks have built their own. For some reason ATV Auger Racks are plentiful. Anyway here are couple of custom carriers and some other ideas. Now all I need is an auger and a sled and I should be set! BD when I was doing sport shows with my bucket racks I couldn't count the number of times I would spend 15 minutes with someone and they would look at me and say "Well when I get a four wheeler I will look you up" Ahhhhhhh... or "Do you have a tape measure so I can get a few dimensions of your rack?" 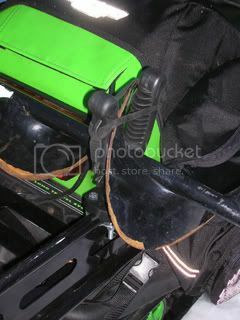 Some things I dont miss! The reality is that after hours of trying with waisted materials ,they'd been better off buying yours. I'd like to see somone try that with the jig. It took thousands to get it to look & hold together like it does today.